While at Toyko Ken a month ago, I spotted a Chinese restaurant within the same shopping complex. I really didn't think much of it. After all, what's so special about a Chinese restaurant? There's one every few blocks in the GVRD. However, for some reason or another, I wanted to try it. They always say that curiosity killed the cat. Well, as long as they are not actually serving cat at the restaurant, it's all good. 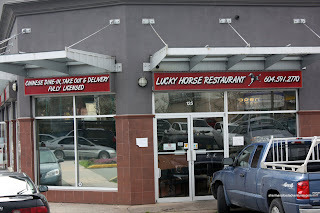 With a name like Lucky Horse, I'm pretty sure Cat is not on the menu. Ma was a bit nervous since I've taken her to a few places that serve items she's not entirely comfortable with. To this day, she still talks about the chicken feet I ordered for Dim Sum. She didn't end trying them though. 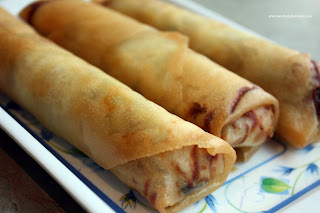 The Spring Rolls arrived hot and crispy. Other than the obvious oil slick at the bottom, these babies were actually quite good (they were veggie-filled). 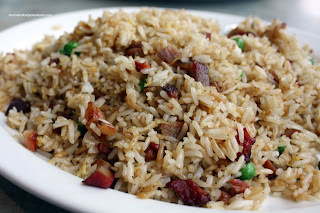 Looking much like something you'd find at a food fair Chinese joint, the BBQ Pork Fried Rice was a bit dry. However, I'd rather have it dry than soggy. It did the job, nothing more, nothing less. While the rice had a dark soy tinge, the meat on top of the Chicken Chow Mein was paler than Nicole Kidman. 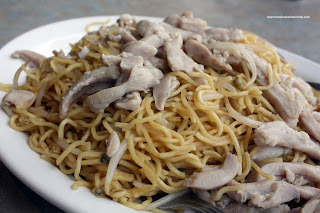 We found the noodles to be on the softer side; but again, they did the job and the copious amount of chicken meat didn't hurt the dish. 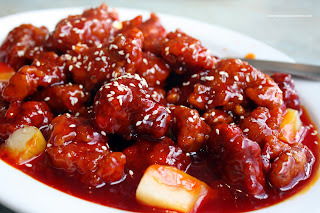 Exhibiting a red that does not readily exist in the real world, the Sweet & Sour Pork turned out to be pretty solid. Most, if not all of the pieces were meaty with very little fat on them. Despite the colour, the sauce had a nice balance of tart and sweetness. I particularly liked that there was very little in the way of fillers in this dish. 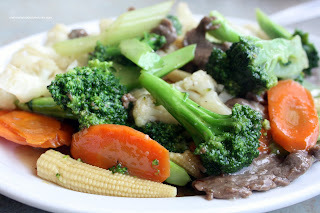 Our last dish of Chop Suey consisted of broccoli, cauliflower, carrots, baby corn and beef. Honestly, the veggies were cooked perfectly with good colour and crispness. Too bad the beef was chewy and there was way too much salt. If you are thinking that the food looks suspiciously like the one you'd find at Manchu Wok, Flaming Wok and Panda Express, you're right. The only difference is that you are being served and the food is cooked to order. Yah, I wasn't expecting "real" Chinese food here. With that in mind, the food was pretty average for North Amercian Chinese food. But, for the prices they charge and the large portions, it will satisfy their target customer. I'm just not one of them. Chinese meal with a neighbor of mine means White Spot.